Myrtle Lawrence, age 100 from Slidell, LA passed away on January 15, 2019. Myrtle was born January 6, 1919 to Jean and Mathilda Bordere. Myrtle was born in New Orleans, LA and was the beloved wife of Octave Joseph “John” Lawrence. 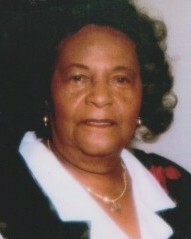 While living in New Orleans, Myrtle joined St. Gabriel Catholic Church. She frequently attended mass and gave her life to Jesus Christ. She is preceded in death by her husband, Octave Joseph Lawrence, her parents, Jean and Mathilda Bordere, her children, Barbara Ann Lawrence Kenneth Lawrence, Bobby Lawrence, and Dolores Lawrence, her siblings Mabel Grayson, Olga Antonio, Alma Smith, Dorothy McCauley, Hazel Davis, John Bordere Jr., Harold Bordere, and Edna Meilleur. Myrtle is survived by her children, Donald (Amanda) Lawrence, Josie (Robert) Conley, Jerry (Tina) Lawrence, Arthur Lawrence, Pamela (Charles) Johnson, Deborah (Alvin) Carter, Keith (Joniese) Lawrence, and Cathy Lawrence. Myrtle leaves behind a host of grandchildren, great grandchildren, and great-great grandchildren. Relatives and friends are invited to attend a Mass of Christian Burial on Tuesday, January 22, 2019 at 10 AM at St. Gabriel Catholic Church, 4700 Pineda St., New Orleans, LA. Visitation will begin at 9 a.m. Interment to follow at Mt. Olivet Cemetery. Tharp Sontheimer Funeral Home in charge of arrangements. Condolences may be expressed online at www.tharpsontheimerfh.com. Information please call 504 835-2341.